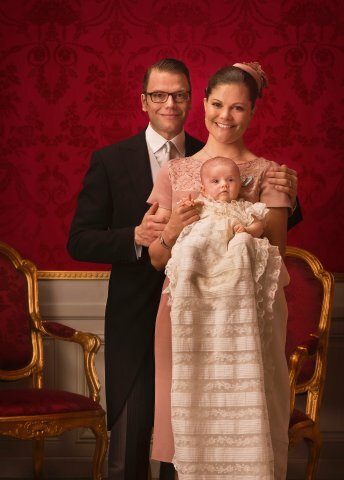 UPDATE: H.M King Carl XVI Gustaf announced the name of Crown Princess Victoria's newborn daughter: ESTELLE SILVIA EWA MARY. Crown Princess Victoria Bernadotte gave birth to a baby girl this morning, February 23rd. The Office of the Marshal of the Realm is delighted to announce that H.R.H Crown Princess Victoria gave birth to a daughter on Thursday, February 23, 2012 at 04.26 am. For more information in English, please click here: Washington Post. Victoria Ingrid Alice Désirée, Crown Princess of Sweden, Duchess of Västergötland, is the eldest child of King Carl XVI Gustaf and Queen Silvia, and was born on 14 July 1977. The declaration of Crown Princess Victoria's majority took place in the Hall of State at the Royal Palace of Stockholm on 14 July 1995. The Crown Princess will be Sweden's first female Head of State from the Bernadotte Dynasty. In modern times Sweden has only had two queens regnant, Kristina and Ulrika Eleonora. On the afternoon of Sunday 30 May, The Crown Princess Couple hosted a reception at the Royal Palace to celebrate the publishing of the banns. The Swedish Parliament (Riksdag) and government were the first to offer their congratulations to The Crown Princess Couple. They were represented by: Speaker Per Westerberg and his wife Mrs Ylwa Westerberg, Secretary-General of the Riksdag Anders Forsberg, Press Secretary Sara Hägg, Prime Minister Fredrik Reinfeldt and his wife Mrs Filippa Reinfeldt, State Secretary Gustaf Lind, Chief of Protocol Maria Elgstrand and Public Relations Officer Roberta Alenius. The Riksdag and government presented The Crown Princess Couple with a glass service that was designed by Professor Erika Lagerbielke and hand-made by Orrefors. Next came the Wedding Foundation, which was represented by Peggy Bruzelius, Hans Dalborg, Marcus Wallenberg, Jacob Wallenberg, Hans Stråberg, Leif Johansson, Michael Treschow, Lars Idermark and Hans Larsson. A banns of marriage service with Holy Communion was held at the Royal Chapel on Sunday 30 May at 11.00 a .m. for The Crown Princess Couple. Apart from The Crown Princess Couple, the service was also attended by The King and Queen, Prince Carl Philip and Mr Daniel Westling's parents Ewa and Olle Westling, and his sister Anna Westling Blom. The Royal Chapel, which holds 400 people, was almost completely full. The sermon was given by Bertil Reimer and the banns were read by Chaplain to The King Lars-Göran Lönnermark. Pastor Erland Ros led the prayers of intercession for The Crown Princess Couple. Music by Bach, Mozart, Schubert, Roman and Riedel was performed by the Guards Sextet from the Army Music Corps led by Johan Nordfeldt, with the Palace Choir, the Royal Chapel's Vocal Ensemble, concert pianist Magnus Svensson and court organist Mary Ljungquist Hén. H.R.H. Crown Princess Victoria, H.R.H Prince Daniel and H.R.H. Princess Estellle. This is an independent nonprofit public service website. For official information about the Swedish Royal Family, please visit www.royalcourt.se.